So when my daughter had a recent play date (to exchange the class pet for our summer care). I allowed them to play while I created swaps for the upcoming convention... the girls wanted to jump in on the crafting fun!! Sooooo I made them into Butterfly girls - lol!! (When Ashley reads this... I know that she isn't a butterfly girl...not everyone is... but seriously - this is a stunning stamp.. but I digress... lol). 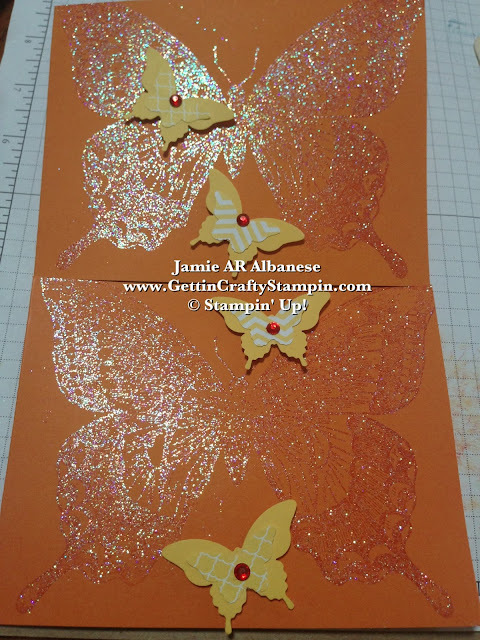 Stamping this image on our Embossing Buddy (#103083) powdered Pumpkin Pie card stock (#105117). 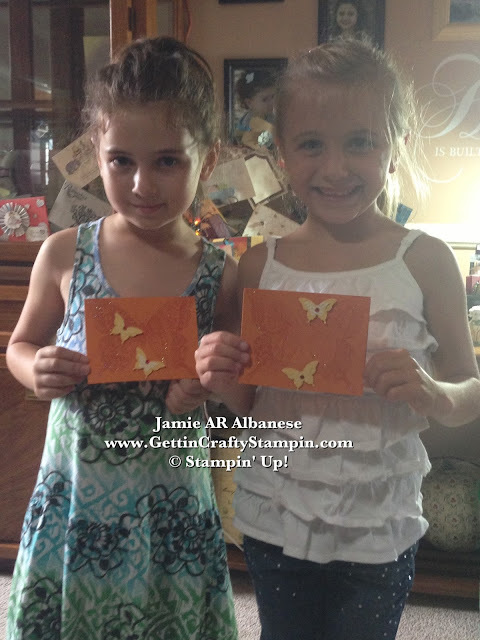 Versa Mark is a wonderful watermark stamp pad that is sticky. 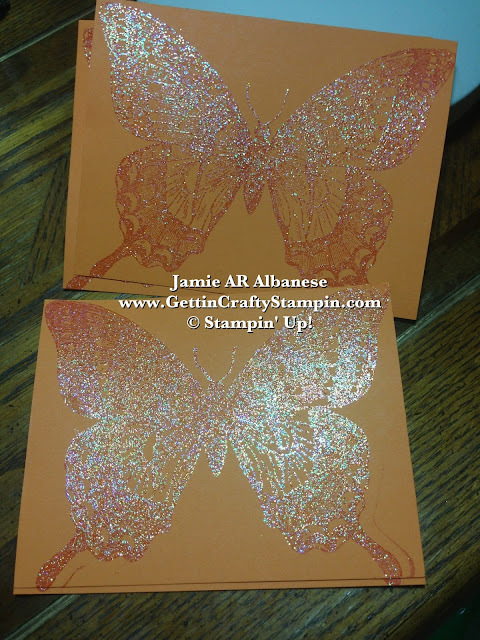 It's ideal for grabbing embossing powders. 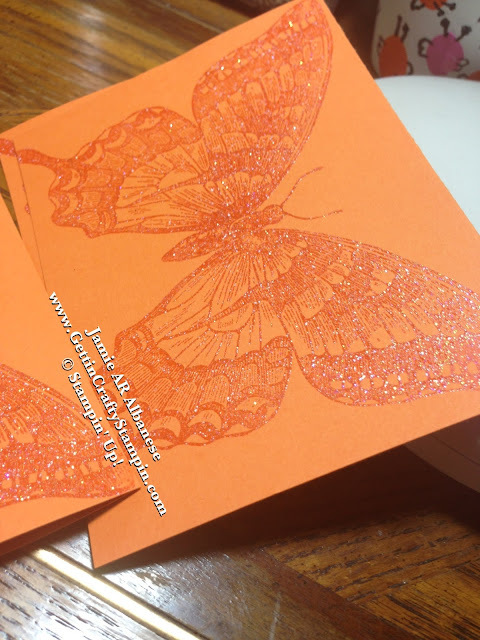 Here Iridescent Ice embossing powder melts with the aide of our Heat Tool (#129053) for a clear but sparkling image! Our Elegant Butterfly punch (#127526) is the ideal base for layering the Bitty Butterfly punch (#129406). Here Daffodil Delight card stock (#119683) and the Daffodil Delight printed page from the Designer Series Paper Stack in the Brights family (#130134) pair perfectly!! Beautiful Sparkles... for these sparkling little girls!! Pops of color added to our adhesive backed Rhinestone Basic Jewels (#119246) with a little coloring in with permanent markers (like a Sharpie, Bic, etc....) for colored jewels that are sure to brighten the day! Brought to you by the hand of two cute 7 year olds! Yeah Baby!! It goes to show that if you've never stamped to stamp often.. great stamp, tools, papers and jewels can make you look amazing (easily!!) and wow others!! CLICK HERE to see the full line of stamps, papers, tools, inks, jewels and accessories! !